When Natalie wrote, a letter could not go above or below the line, even if that was how it was supposed to be written. A letter that dropped below the line signified hell. Above the line symbolized heaven, but was still a sign of death—her own or that of someone she loved. She wore holes in her papers as she erased errant letters. Hiding my anguish, I tried to reason with Natalie, but I could not convince her that she didn’t need to agonize over every movement of her pencil. Six months later, my husband asked to move back in, promising to be a faithful family man. I was seeing a counselor at a college where I was taking classes toward a bachelor’s degree. 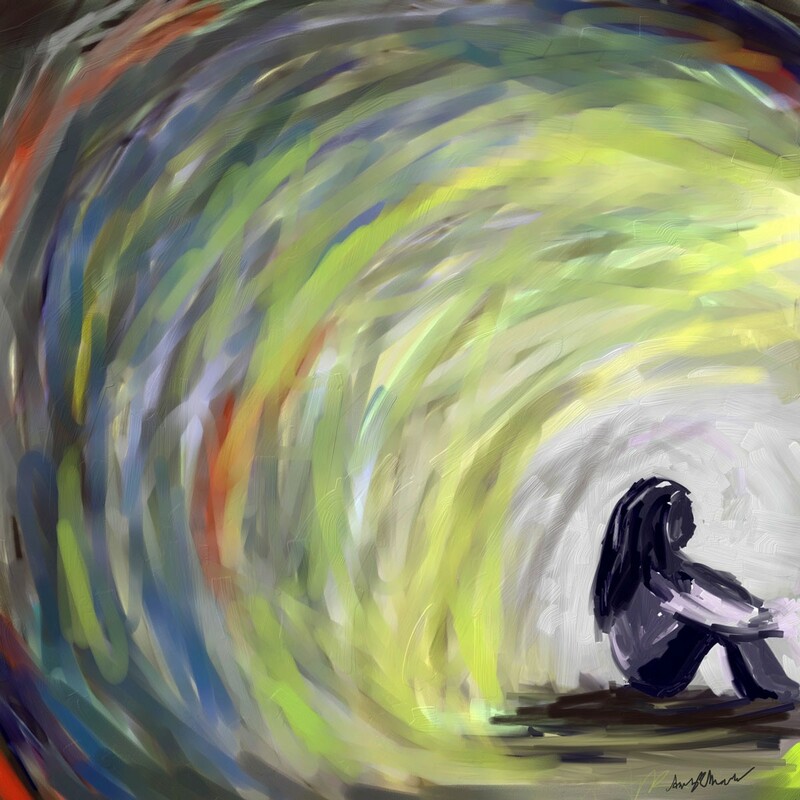 Depression gripped me, and I couldn’t focus on schoolwork. I told the counselor about a dream that Natalie had recently. Her dad was chasing me around the house with a knife. He caught up with me and stabbed me. I fell to the floor, but got back up and went grocery shopping. But I did. I was afraid that our kids and I couldn’t make it on our own. Before returning to school, I’d been a waitress. Now I couldn’t imagine mustering the energy to run around a restaurant or the cheerfulness to serve customers with a smile. Within five months, my husband told me that he was still in love with his girlfriend and wanted to be with her. My family was ripped apart again, my depression deepened, and Natalie’s “worries” flared. Before leaving a room, she had to turn the light on and off several times and had to take a certain number of steps before she could walk out. She often got stuck in rooms because she was convinced that she had not taken the correct number of steps and had to start over. I wanted to wrap her in my arms, protect her, and ward off her tormenting thoughts. I was able to get Natalie into counseling through United Way. After Melissa, a social worker, got to know Natalie, she told me that Natalie was suffering with obsessive-compulsive disorder. I, too, was battling demons. I hated getting out of bed in the morning. I wanted to hide under the blankets instead of facing another day. Yet I hated going to bed at night, where I lay awake imagining my husband lying in the arms of his lover. Living seemed intolerable. A few weeks into sixth grade, Natalie gave up on her schoolwork. If she was assigned homework in a book that had a word associated with death, she would not bring the book home. She could not use public washrooms, so she flew through the door and ran to the bathroom every day after school. She performed counting rituals at school, tapping her fingers on the underside of her desk, where classmates couldn’t see what she was doing. It took so much effort to hide her rituals from the other students that she had no energy left for studying. I got a note from one of her teachers saying that Natalie had quit trying. I was used to getting glowing reports about Natalie at parent-teacher conferences. Now I was told that she was not turning in her homework or paying attention in class. Natalie begged me not to tell her teachers about the OCD. I felt that they needed to know, but I couldn’t betray her trust. When I talked to her teachers, I told them that she was having a hard time dealing with her dad and I splitting up. At the next appointment with Dr. Bennett, the psychiatrist, Natalie stayed in the waiting room for a few minutes so I could speak to Dr. Bennett alone. “Natalie is losing the ability to function and might have to be hospitalized,” Dr. Bennett said. A few days later, I let my tears fall as I told Melissa what Dr. Bennett had said about hospitalizing Natalie. Melissa agreed that such a drastic measure could push Natalie over the edge, and she started seeing her twice a week. I held my breath as Natalie struggled to resist performing her rituals. Before our divorce was final, my husband again asked me to take him back. I was working two office jobs with long commutes. I felt so weary and hopeless that I was tempted to give in. But I knew I had to be strong if I wanted Natalie to be a fighter, to triumph over her obsessions and compulsions. “I want to go back to school, but I’m a single mom, and I’m too old. Several months later, shortly before the school year began, I was folding laundry in my bedroom when Natalie ran in. With a Kleenex in her hand, she began frantically smashing bugs she thought she saw on the wall. There were no bugs. She continued to kill the nonexistent insects. She did not stop. I tried to hold and console her, but she wrestled free and, in a trance, went on with her compulsive extermination. I slumped on the bed and cried. I’d never seen her so unreachable. After Natalie wore herself out, she let me cradle her until she fell asleep. The next morning, she was cheerful and said she was going to call a friend to see if she could come over. Natalie had no memory of the night before. It was as if she had a fever that peaked and then began to cool. Her OCD symptoms did not go away completely, but Natalie was no longer enslaved by unrelenting intrusive thoughts. She was resilient, and I felt renewed. Linda Ingwersen is the mother of three children and the grandmother of four. While a single mother, she attended Loyola University Chicago School of Law, where she was a Civitas ChildLaw Scholar and a senior editor of the Children’s Legal Rights Journal. After law school, she became the legal researcher for the child protection judges at Cook County Juvenile Court. She has retired from her most recent position as attorney editor and has begun writing essays focusing on relationships and mental health issues.